Our first born was always a happy eater. We modestly attributed this success to our excellent parenting skills. We came to parenthood with certain philosophies - namely, eat what we're having or go hungry, but in all honesty, we never really had to put this to the test. He ate what was in front of him, and that was that. Second born had less enthusiasm for all things nourishing. To begin with, she was breastfed, but this was never going to work exclusively when mum went back to the office. We tried offering her the bottle, but she refused it every time, even if mum went out of the house at the time. On the day mum went to work, she took the bottle quietly, calmly, naturally, as if she always had. 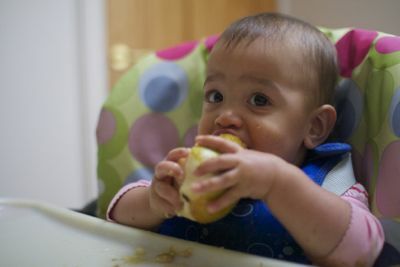 Moving on to solids, she remained picky, and years later, she's still a modest eater. This was surely the result of the same excellent parenting that made No 1 a glutton, except she actually does refuse what we're having, and goes hungry. There are a couple of rules - the promise of dessert can sometimes result in the swallowing of a couple of vegetables, and she's not allowed to wakes us up early for breakfast. If she's hungry, that's her problem. Generally though, she's content on minimal rations. She's healthy, and has enough energy (though not the maddening energy surplus of No 1. She's healthy though, there's probably enough getting through. Like her milk bottle, she'll eat if she's hungry enough. Eating disorders come much later. The ideal course would be to ignore her; leave her to eat or not, but in reality, she's such a slow eater that I have to tell her to eat up or we'll be late for school / swimming / bed / the next meal. No 2 has become a little pickier as he's learned at school that by popular agreement, certain foods are disgusting - infuriatingly his eating habits now have more to do with fashion than taste. As it happens, No 3 is a ravenous gannet, and apart from loud protests if we feed her too slowly, feeding her is a pleasure.